Somewhat out of the norm from what we’re used to seeing with most cases for Apple’s products, the Nashville, Tennessee based company Beamhaus has something very unique when it comes to cases for Apple’s beloved products. Today, we’re getting the chance to check out a couple of sleeve cases for the iPhone 5 and iPad – both of which have a very peculiar design to them. At first glance, both the Beamhaus Pocket for the iPhone 5 and Portfolio for the iPad have a very tuxedo like design to them, which of course, helps to give the two sleeve cases some prominence over other things. Who knows, but the two would perfectly accompany James Bond into the bar scene. So what makes Beamhaus’ collection so unique? Well, the materials are hand-selected from Chicago’s famous Horween Leather Company, which contributes to a very quality feel and construction. 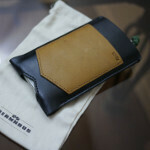 Glancing at the Beamhaus Pocket, we have to admit that it is one tight fitting sleeve case for the iPhone 5. However, we appreciate that there is a cutout at the bottom of the sleeve that enables us to push out the smartphone. Additionally, the Beamhaus Pocket incorporates an outside pocket that allows us to carry along a credit card or something else smaller. It’s not enough to replace your entire wallet per se, but hey, when you’re trying to travel light, it’s enough for smaller occasions. For the iPad, there’s the Beamhaus Portfolio, which looks similar to manila envelope with its design. Yet again, it’s the quality leather material that really helps to make the sleeve stand out. Indeed it’s a simple thing with its envelope-style cover flap, which incorporates a hidden magnetic closure. Of course, it accommodates the 2nd, 3rd, and 4th generation iPads, so it’s nice to see that the plush lining doesn’t add much bulk or thickness to the already streamlined tablet. Taking into account their luxurious material and meticulous construction, there’s a premium price tag attached to the Beamhaus Pocket and Portfolio sleeves. In fact, the Pocket will set you back $60, while the Portfolio sells considerably more at $100. Without question, not everyone is going to be gung-ho about picking them up at those prices, but nevertheless, some will appreciate their luxury attachment.